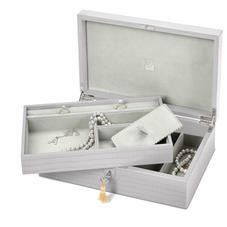 The Aspinal Savoy Jewellery Case is a wonderfully handmade slightly smaller replica of the Grand Luxe Jewellery Case. Individually handmade in our workshops by our master craftsmen in the same fine jewel calf leather or sumptuous Amazon leather and lined in Aspinal signature contrasting soft suede to protect your personal treasures. 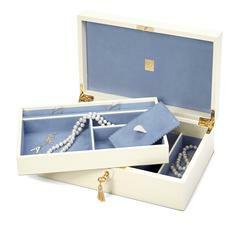 The top layer consists of 10 inch ring roll, a square compartment and two smaller compartments with padded lid for smaller pieces. 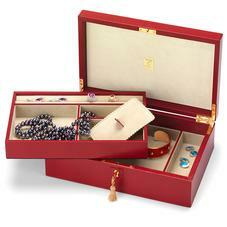 The lower layer includes two necklace compartments and one larger compartment. This Jewellery case closes with solid brass/nickel lock and opens with a small key with silk tassel. 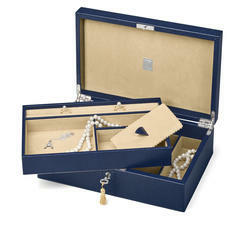 The Aspinal plaque sets off the inside, the lid and the hinges and fittings are all in solid brass or nickel.